Liam Neeson stars as "The Man from the Future" in a Super Bowl ad for LG's new G6 OLED TV. The Super Bowl commercial for LG's new ultra-thin TV has a decidedly sci-fi bent. 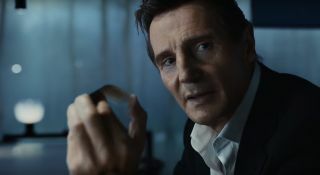 The minute-long ad, which will air Sunday (Feb. 7) during Super Bowl 50 between the Carolina Panthers and Denver Broncos, stars Irish actor Liam Neeson as "The Man from the Future," who travels back in time to tell a younger version of himself (played by Neeson's son, Micheal) about the coming revolution in viewing technology. That revolution, according to the commercial, is the G6 OLED TV, a soon-to-be-launched product that LG representatives say is as thin as four credit cards stacked on top of one another. The ad's executive producer is Ridley Scott, the director of such prominent sci-fi films as "Alien" (1979), "Blade Runner" (1982), "Prometheus" (2012) and 2015's "The Martian," which was recently nominated for six Academy Awards. Scott's son Jake directed the new "Man from the Future" LG ad.